Le's Hair Pro at Garland, TX. We are specializing in hair featuring the latest in hair cuts & styles, hair color, highlights, permanent straightening, and perms of the highest quality. Le's Hair Pro Salon opened in November of 1995 with a goal of providing the best service in a pleasant, friendly environment. We are located on NE coner of Jupiter & Arapaho Rd (Beside Dollar General). Our hair stylists are high qualified and each have many years of experience in Garland's top hair salons. We use the latest technology and finest quality products from brands like L'oreal, Kerastase and Arimino. We hope to have a chance to serve all of your hair needs. This is not my normal place to get a hair cut but I use Hair Pro when I need a quick hair cut. Every time I go here I am always warmly greeted and the wait times are under 10 minutes even on busy days. The hair stylist is always friendly and pays attention to what you tell her to do. She does not go off and experiment on you. She give you the cut you ask for and makes you look good. 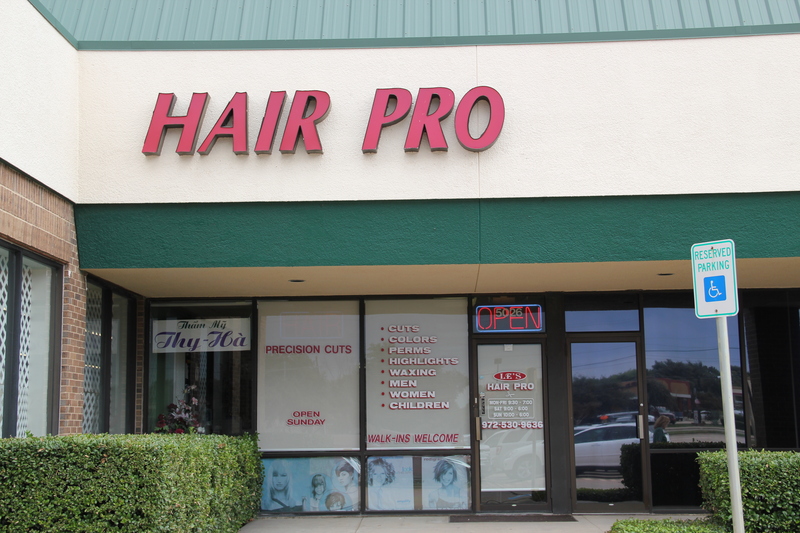 If you are in need of a great hair cut at a great price then you should try Hair Pro out. I think you will be happy as I am.